The long-standing road-car lap record for the Isle of Man TT circuit has been comprehensively smashed in a production-spec Subaru WRX STI saloon. In his very first run around the challenging 37.8-mile course, former British Rally Champion Mark Higgins posted a blistering lap time of 19 minutes and 56.7 seconds, translating to an average speed of 113mph. The peak speed achieved during the lap was 162mph. Higgins’ time is more than two minutes faster than the previous record, set by the late Tony Pond 21 years ago to the day (on 6 June 1990), at the wheel of an Rover 827 Vitesse. Pond was the first to break the average 100mph barrier in a road car, and his lap record has stood ever since. The TT event organisers gave Higgins just one lap to conduct his record attempt in the car, and there was no opportunity to carry out high speed practice runs. The WRX STI used for the record breaking run was a standard Subaru production car, equipped with a 300PS Horizontally-Opposed Boxer engine, unmodified brake callipers and with road-legal Pirelli P Zero Trofeo tyres. Springs and dampers were adjusted to minimise any potential damage when the car encountering the various bumps and jumps at high speed along the course. In recognition of the speeds involved, and the fact that there are little or no crash barriers around most of the TT road circuit, the WRX STI was fitted with some essential safety enhancements. These included an MSA-specification T45 integrated roll cage, TRS race harnesses and a Lifeline extinguisher system. 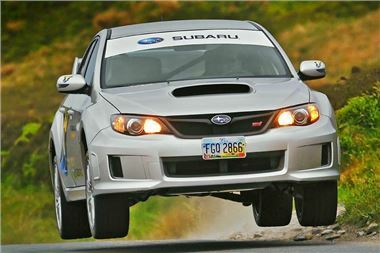 To help forewarn spectators of the presence of the oncoming car, the Subaru team also fitted the WRX STI with a high-decibel exhaust. “Setting the record was both the most exhilarating and the most frightening thing I have ever done,” explains Higgins, whose career as a driver in the British and World Rally Championships hasn’t exactly been short of excitement. “The rules allow for a flying start, so I crossed the line at 125mph. I then went down through the Bray Hill junction – normally taken at around 20mph – at over 150mph. Once that tricky section was out of the way I settled into the lap and quickly got used to the balance and sheer pace of the car. The WRX STI is currently available from all Subaru dealers with free satellite navigation and a free power upgrade, taking the power output to a blistering 320PS – more than enough, no doubt, to break the Isle of Man record yet again. The outright lap record on the TT course was set in 2009 by John McGuinness on a Honda CBR1000RR ‘Fireblade’ motorcycle. McGuinness posted a time of 17 minutes and 12.3 seconds, equivalent to an average speed of 131mph.